Recently, we covered the top tips to help indie developers get their game featured by Apple, but what about getting featured on Google Play? The Google Play Store is different from Apple’s App Store, so it’s important to approach it differently as well. If you want to get your Android based game or app noticed by Google’s editorial team, there are five quintessential tips that you need to follow. Applying these core strategies will improve your chances of discoverability and your odds of getting featured on Google Play. The types of apps and games that are getting featured on Google Play are the ones that are not only high-quality but Android-friendly as well. Having a solid understanding of how the Google Play Store works is a must if you want to make a game that will get noticed by their editorial team. Staying on top of the latest Google Play news and features will also help lead you in the right design direction for your game. Google Play operates differently than Apple’s App Store on multiple levels. Understanding how users discover apps on the platform and their best practices and guidelines will make it easier for you to succeed. First off, Apple tends to gravitate towards newly release titles while Google Play focuses more on engagement, popularity, the type of app it is and the overall quality. Most of the games getting featured on Google Play have a 3.9 to 4.5-star rating or higher and a minimum of 50,000 downloads. These two requirements alone, make having a good promotion and app marketing strategy pre and post launch mandatory, especially if you want your game to get noticed. The way users discover apps and games in the Google Play Store is based on both automation and their editorial team, which means optimization and creating a high-quality Android-friendly app are equally important. Each of these sections can help potential users stumble across your app. The Collections are based on each user’s past activities, previous searches, and location. The Top Charts are lists highlighting new apps, what’s trending, and the most popular games and apps. The search allows users to find apps based on keywords. Google Play’s app search functions much like the Google Search Engine itself which makes SEO practices and optimization useful. The Android Excellence and Editors’ Choice sections are both led by the editorial team. Android Excellence is a features section that highlights apps and games that meet all of the quality guidelines and best practices that Google Play encourages. According to Google, the apps featured in Android Excellence set the bar. To get a better understanding of the best practices and guidelines that are required to be considered for placement in the Android Excellence feature category, review the guides in the Google Play Developer Console. They’ll provide you with a wealth of information on how to make a great Android based application. Check out the ‘best practices’ and brush up on the play policies. The Editors’ Choice section features the best Android apps in various categories with stellar design and innovation. 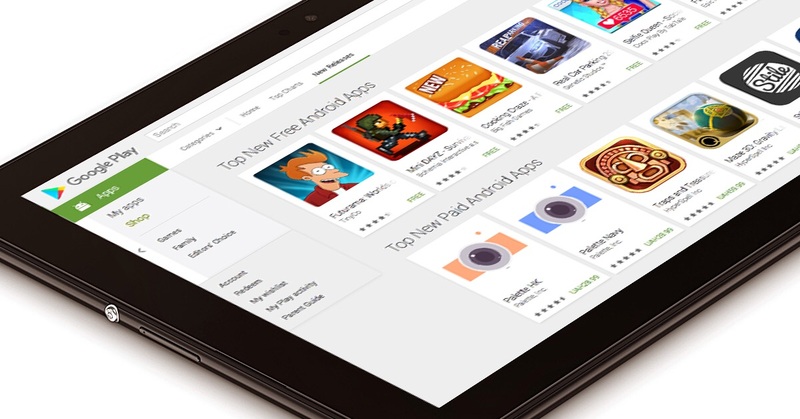 The Google Play editorial team hand selects each of these feature apps. If getting featured on Google Play is your goal, studying both of these sections are key. There are also companion guides called playbooks to provide you with tips on various topics that you can download as an app. The playbooks for developers are convenient ways to learn the basics on certain subjects while you’re on-the-go. It doesn’t include all of the additional documentation and in-depth instruction that you would find on the console but it’s a nice starting point for new or busy devs that want to review the core fundamentals easily. Since getting featured on Google Play doesn’t happen as often as it does on Apple’s platform you have to make sure that you’re releasing a game that is Google Play Store feature worthy. Set aside some time to study the Editors’ Choice and featured games in your preferred category. Browse through Google’s Editors’ Choice section and view their featured apps and games. These games and listings will give you a clear idea of the type of games that the Google Play editorial team are likely to feature. There’s no guessing involved when it comes to the Google platform. The layout in the Editors’ Choice Games section is an excellent example of this. There are currently six categories listed such as puzzles, runner games, racing, arcade, role-playing, simulation, and sports. Each of the categories includes a tagline and brief intro that will provide you with a good idea of what the games all have in common. Then they take it even further by giving you a numbered list of the top three reasons why they love that particular app. It’s pretty cut and dry, but if you’re not studying up on the competition, you’ll completely miss it. So, let’s take a closer look at one of these featured games categories and see what we can learn from it. In the puzzles category the tagline is ‘Puzzle Games to Test Your Logic,’ and in the brief intro, they make a point to say how puzzles come in many forms from tile-matching to epic adventures. This is a great indication that they’re looking for various puzzle based games that stand out. As you scroll down the page, you’ll see all of the featured puzzle games. You can see the number of reviews and ratings, why we love this, and a short description. 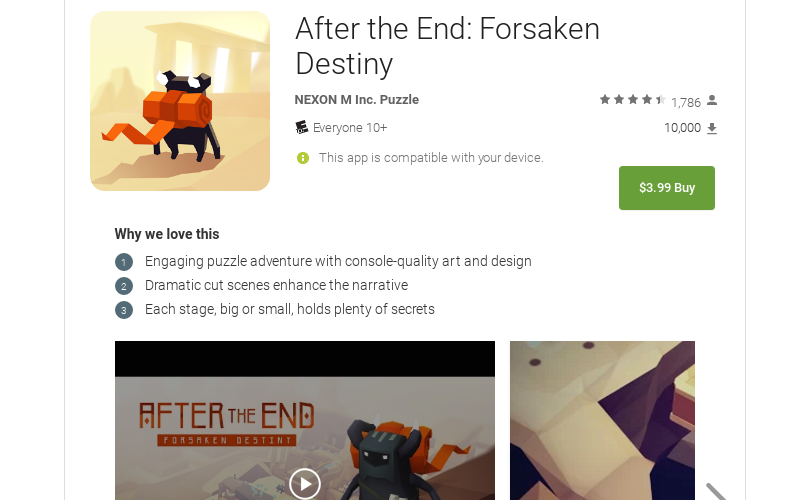 Let’s examine the feature listing for the Editors’ Choice pick ‘After the End: Forsaken Destiny by Nexon M Inc.’ In the ‘Why we love this’ section console-quality art and design, and dramatic cut-scenes are key reasons why the game was featured. It also states that the stage holds ‘plenty of secrets’ which means it’s challenging and engaging as well. If you click on the ‘see more’ button you’ll be lead to the app’s actual page listing where you can view their description, read reviews, and find developer information. Try to do this when you’re coming up with your initial game concept and design. Every several months check to see which apps are getting featured on Google Play, study them and take notes. A good rule of thumb to follow since it’s only updated quarterly is to create a spreadsheet to record all of your findings to keep as a reference. Just set a reminder to update it when the next list of featured apps are released. Use your research to help you make your game feature worthy. Another important tip for getting featured on Google Play is to aim for ‘Android Excellence’ in your game design. Implementing these key factors for success like good UI and UX design, engagement, localization, and supporting Android new features and devices will help boost your chances of discoverability and impressing Google’s editors. Your app must provide players with a great user experience and design. Technical performance is also important. Try to make sure app is polished and free from any errors before you release it. Adding polish is much more than quality graphics, it’s the entire design and overall flow of your game. A polished game has top-notch graphics and cohesiveness throughout. The art style, theme, and gameplay are balanced. The app is interactive and engaging to users. To create a well-polished app, you have to test it, use the feedback to make changes and improvement and repeat the process until you have a near perfect app. When you’re testing, it’s best to use beta testers instead of relying on friends or family members for feedback. Google Play encourages testing this way as well. They even have an early access program that you can apply for if your game or app launch is coming up or has only been launched within the past 60 days. It’s worth taking advantage of if you qualify. Another factor that’s often overlooked is size. On Google Play size matters, especially when it’s your app’s file size. Try to keep your game’s file size under 100 MB. Large file sizes will slow down performance and ruin your chances of getting featured on Google Play. Remember, Android devices run more smoothly with low memory applications, so this is a characteristic they tend to look for in apps. In fact, Google Play has a feature game category titled ‘Great Games under 25 MB’ which serves as proof that size can be determining factor. Your app’s overall engagement and retention also determine it’s rank and potential for getting featured on Google Play. The best way to achieve a high level of engagement is to make sure your game has massive replay value. You can do this by making your game’s difficulty slowly ramp up to challenge players. Adding different modes, bonus zones or unlockable worlds and crazy power-ups work well too. You can also add cool unlockable characters and customization options that require players to continue to play to earn them. Integrating an engaging reward system will add immense value to your game as well. When players are being challenged and having fun, it’s a winning formula. Examine the top charts and featured games with the highest engagement. Read the reviews on why players love the game, play them and try to add those features or aspects into your app. Encourage your users to rate and review your app by integrating incentives or adding a notification pop-up. Include social media sharing buttons within your app so users can quickly post and share. Make an effort to update your apps and games regularly, whether it’s monthly or quarterly. Try to add new content to your app to keep your current users engaged and to help attract new players as well. Google Play has over a billion active Android device users in more than 190 countries in the world. The wide reach makes localizing your app an important factor to Google. It’s so much so that you can localize your application directly from your developer console using their services or have your own translations done and import. Not every game or app is ideal to launch globally. To save money and precious time, Google Play recommends that you do your research and be selective about which countries to target. They also have guides and downloadable playbooks available on localization in the developer console that you access for further guidance. Making sure your app supports various Google Play devices is another way that you can not only make your app Android-friendly but increase your chances of getting featured on Google Play as well. Adding compatibility for popular Android-based smartphones and tablets like Samsung Galaxy and Amazon Fire is a good starting point. There’s also Android TV, Android Wear, Android’s platform for VR called Daydream and other devices that you can consider making your app available. Like most platforms, they love it when you integrate their tech and features into your app. An optimized Google Play Store listing will also increase your odds of getting featured on Google Play. If you’re unfamiliar with ASO or in this case, GPSO (Google Play Store Optimization) it’s the process of optimizing or improving your app page listing for better visibility in search and ranking. It’s a form of SEO (Search Engine Optimization) that focuses on the app store. Your app’s icon, screenshots, title, keywords, description, and reviews all contribute to its discoverability. Your app’s biggest selling point is its graphics. Always use the best high-resolution images possible for your app icon and screenshots. Keywords are also an important factor for optimization. The objective is to find low competitive but relevant keywords with average to high traffic to optimize your listing. You can use tools like the Google Keyword Planner, OneLook, Mobile Action, Sensor Tower and App Annie to research and find ideal keywords to use. For more in-depth tips on selecting keywords, you can check out our previous post, App Store Optimization: Finding ASO Keywords, many of the techniques can be applied for GPSO. Once you have your target keywords, try to include your main keyword in your app title. There’s a 30 character count for app titles but try to avoid keyword stuffing. If getting featured by Google Play is your aim, you have to make your app listing look professional and not spammy. There’s also a short description and a long description for your game. It’s best to squeeze your main keyword somewhere at the beginning of your short description for better optimization. When you’re writing your long description, try to focus on keyword density and content. Tell readers why your app or game is unique. Try to work your target keywords into your description at least five times or more. Remember the secret to good optimization is quality. 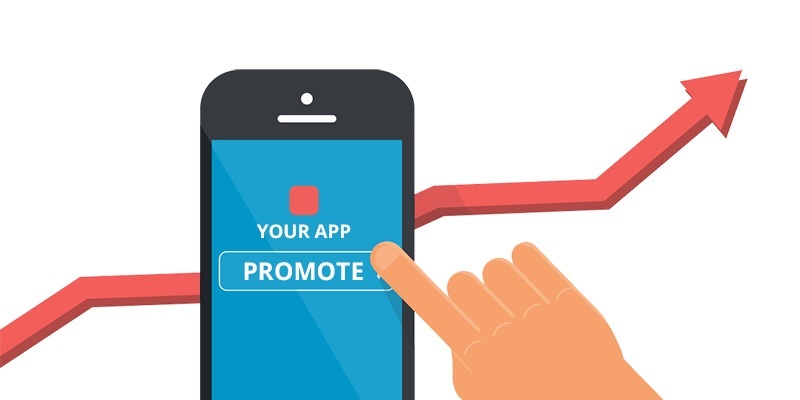 To get your game or app featured on Google Play, you have to promote it continuously. They’re looking for games with well-above average star ratings, reviews, and a sizeable amount of downloads. Promoting your game is also essential for success. There are tons of different methods that you can use to help generate buzz around your app. The first step you should take is to create a website or simple landing page for your app. This can easily be done using platforms like WordPress, Blogger, or LeadPages. Get social. Create social media accounts for your game or studio on Twitter, Facebook, and YouTube. Start posting teasers, screenshots, and updates consistently. Try to blog about your game development journey to help build a community of loyal fans around your app. Be active on game and development forums and post about your app. Use YouTube to generate installs. Make YouTube videos highlighting your game in the form gameplay trailers, teasers or Vlogs of your development process and use YouTube cards to add links to your app. Promote your game on sites like Product Hunt. Create a press kit and press release. Contact journalists, bloggers, and game reviewers and pitch your game to them. Try to get a write-up or review on your game from multiple sites to help generate buzz. You can also invest in Facebook or Google Ads to help promote your game and increase installs. When you’ve reached the requirements for a possible feature, continue to push and reach out to press. Remember that connecting with Google Play’s editorial team is harder than connecting with Apple’s team. At the time of this writing, there’s not an official submission form for requesting feature consideration. Featured apps and games are chosen solely by the editorial team. You have to create a stellar Android-based app and heavily promote it to get their attention. However, if you’re lucky enough to find and connect with someone who works at Google Play you can pitch to them directly. Although these tips will increase your chances of having your game featured, there’s no silver bullet or single factor that will guarantee instant results. Remember, getting featured on Google Play is not easy. Take the time to learn how the Google Play Store works. Study the Android apps that are getting featured on Google Play and look for ways to model to improve. Strive for ‘Android Excellence.’ Also, don’t forget to optimize your app’s page and continuously promote it. Google Play only showcases feature apps quarterly, so do your best to market your game and increase its overall rating. If you want to be successful, be consistent and don’t give up. Success is always closer than you think. Thanks for giving such amazing tips! I read some of your posts you are good at technology. Keep posting! Thank you for these amazing tips !